I'm doing a quick one here today because I completely missed my cue this morning. Reason - I was writing! And I ended up getting lost in the story, coming onto the Net with only an hour to spare before I had to dash out to go get the kids. Now I'm here in between parking him in front of cartoons and me needing to go in for kitchen duty. Speaking of which, I just came upon this lifesaving book! 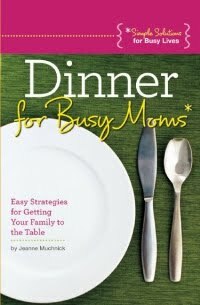 Dinner For Busy Moms by Jeanne Muchnick (Plain White Press, 2010). Ever felt your sanity is running on desperately low at dinner time? For me it's worse because I actually start hyperventilating the minute I go into the kitchen and start to imagine, what's for dinner? Doesn't help that the minute my kids get in at 3, the first thing I hear as we're going up the stairs is, (you guessed it!) What's for dinner? The book's main focus is about getting the whole family to the table. I didn't have much of that issue since my husband and I decided early on that we both wanted the no-TV, no-distraction type of meals in our house. We both grew up in houses where food was eaten on the go, and we wanted this as a routine. However, there are tons, and I really mean, tons of tips about how to organize and streamline the cooking and dinner-serving process. The book also gives awesome strategies for dealing with picky kids and trying to satisfy the maximum number of people at your table. Peppered through with tips and hints from 'real moms' out there, added upon by the easy flowing conversational tone the author adopts in the book, this is one book to help with keeping sanity levels up. I tried some of these tips. Instead of fixing everything for everyone, I made tortillas, shredded grilled meat, and chopped tomatoes, cucumbers and a coleslaw-style cabbage dish and placed them all on the table, along with an array of sauces (mayonnaise, ketchup, rave, peri-peri). For once there was peace at dinner, because everyone fixed their food as they wanted it. Kids even ate vegetables, can you believe it? I did the same thing again when some roast chicken was left over. Again, peace! Do try out this book - I promise you won't be disappointed! From this insane undomestic mom to you, this one is a true lifesaver! This book sounds awesome. I will have to get it when the critter gets old enough to eat with us at the table. Thanks for sharing! I have a writer friend who used to have the same problem. What she decided to do was cook her dinner early in the day, while she's writing so it's done when her hubby gets in. This eliminates that last minute rush. She also plans out her menu for the week so when she goes grocery shopping she gets everything she needs in one shot. It's a Godsend, Angela. You'll like it. It's written in an easy, Mom-to-Mom language. I do the weekly planning too, but before it was for basic commodities that I might need during the week. Now I actually plan a menu and buy accordingly. I'm also finding it easier to either cook for 2 days, or cook 1 day and use leftovers creatively the next day. Sure helps in opening up some evenings. Thanks so much for the very nice review. I am all about how to get meals on the table when you're NOT a cook so appreciate that you "got" that. I also believe the best advice is what we get from other moms. Thanks again for your honesty. I'm glad you got to discover this review - once again, I really liked this book and only stated the truth in my post.